Main Characters and supporting ones: Who do I want to work for? Could we design a device to help Bobbie Cat overcome the blindness? How could we prevent the flood happening in New Orleans? Design a better way for the next flood city to take care of the animals. Who's bigger; Bobbie or Bob Cat? How did the wind effect the flooding? What do we need to design a system to help the animals? 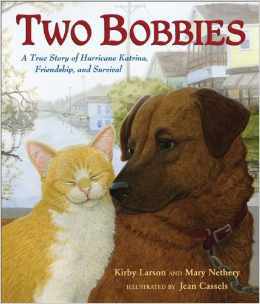 How could Kirby Larson and Mary Nethery know exactly what Cat and Dog did during their journey to the animal shelter? But the two animals had to have a history together, so the two writers imagined one. Could you think of another history of the two together?